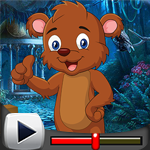 GenieFunGames - GFG Genie Little Room Escape 3 is another point and click game developed by Genie Fun Games. Player's had experience our genie little room escape part 1 and part 2 now you going to play our part 3 of little room escape game. It will be interesting like before one. So go ahead and find the way to escape. Use and interact with objects, puzzles and symbols. Think and solve everything and finally escape from little room. Good luck and have fun!